BlackBerry phones have some high profile fans, with the likes of Tim Allen, President Obama and Google CEO Eric Schmidt all having publicly came out as being users of the popular smartphone platform. For many years, it has gained a die-hard following of fans who love its powerful email capabilities, comfortable keyboard and robust build quality. But that’s not to say it didn’t had a rough few years. Sales are down, and it has struggled to keep up with the popularity of Android and iOS. But the Canadian phone manufacturer has a few tricks up its sleeve. They’ve just released BlackBerry 10. This is a new operating system written from the ground up, and whilst it might not be to everybody’s taste, it has some pretty irresistible features. Here are ten reasons why you might want to give it a go. The nineties were a simpler time. Take for example, electronics. If you were out of the house and you wanted to make phone calls, take photos and listen to music, you’d best be carrying a cell phone, camera and a Walkman. Then suddenly cell phones started doing all those things, and your pockets became significantly lighter. That, my friends, is called convergence. BlackBerry 10 takes convergence a step further by shoving your SMS, BlackBerry Messenger, email, and social networking and shoving it into a single hub. And yet, it does this without being confusing or crowded. All messages are kept in a single thread. You can scroll through that, and easily identify the source of each message, allowing you to prioritize which ones you care about responding to. In addition to that, you can look at messages and events in a single thread based upon their origin. Although I’d normally be reticent to keep all my communications in a single location, ‘the hub’ is remarkably well executed, and feels astonishingly well-polished. Multitasking is something that has traditionally been the bête noire of most mobile phone operating systems. It took until the fourth iteration of Apple’s iOS to allow the user to use multiple apps simultaneously (although Cydia brought about an unofficial multitasking system earlier) and Microsoft’s stab at it in Windows Phone has been heavily criticized for being obtuse and confusing. BlackBerry 10 gets it spot on. You move an application to the background by swiping upwards with one finger. It’s as simple as that. It is then you are be presented with all the applications that are currently open. Each has an icon which shows their state as it was when when you left them. Closing an app couldn’t be simpler. Just tap the little cross in the bottom left corner. Returning to an app is a simple matter of tapping its icon. Hugh Grant has it lucky. With his foppish, Mr Darcy manner of speaking, he’s unlikely to ever come a cropper when it comes to voice recognition. The same can’t be said for this poor chap from Microsoft. Sadly, not all of us are so lucky. Speaking as someone with a regional English accent, using Siri and Google Now is almost impossible. Imagine my surprise when I discovered that the voice recognition built into BlackBerry 10 works pretty well. I was able to accurately dictate an email without getting any strange results, and punctuation was intelligently and accurately inserted into my message. Whilst voice recognition isn’t the core selling point of a BlackBerry phone, it’s refreshing to see that this important feature hasn’t been neglected. Gestures are the cornerstone of the BlackBerry 10 experience, making it easy for you to navigate your device. As I mentioned earlier, swiping upwards shows all applications that are currently running. From here, swiping right brings you to the app menu. Swiping down allows you to access your settings as well as allowing you to turn off Wi-Fi and Bluetooth, and change how you are notified about messages. Swiping left brings up the messaging hub. And that’s pretty much it. There’s not a lot to remember there, and yet that’s enough to easily navigate and traverse through your phone. This is wonderful when you consider that a great user experience didn’t typify earlier versions of the BlackBerry. It’s evident that they spent a great deal of time, effort and money getting it ‘just right’ in BlackBerry 10. The measure of any mobile operating system is the health of its app store. Apple and Google both boast over 500,000 applications available to download and purchase. Windows Phone has significantly less. BlackBerry boasts a slightly paltry 70,000 applications. And yet, this shouldn’t be too much of a concern for any prospective owner. Despite being an incredibly new operating system, I found that the applications most people care about are present and are of good quality. Skype, Flixter and WhatsApp are available to download, and I found a killer Reddit client called ‘Reddit in Motion‘. Simply put, there are very few things that I can do on Android or Windows Phone 8 that I can’t do on BlackBerry 10. Prospective BlackBerry purchasers should know that the owners are desperately trying to court and grow its developer community. To do that, they are throwing money and phones at them in order to convince them to develop for their fledgling OS. It seems they have had some success. The Playbook could run Android applications, and BlackBerry 10 is no different. It makes use of a compatibility layer not all that dissimilar to WINE on Linux and transparently allows you to install Android applications. The only caveat is that that they have to be converted from the ‘apk’ format to BlackBerry’s ‘bar’ file format. So, why is this important? Whilst many Android applications have some form of analog in the BlackBerry World store, there are a handful of noticeable exceptions, including Snapchat and Instagram. With the compatibility layer built into BlackBerry 10, it is possible to run these apps, and many more. 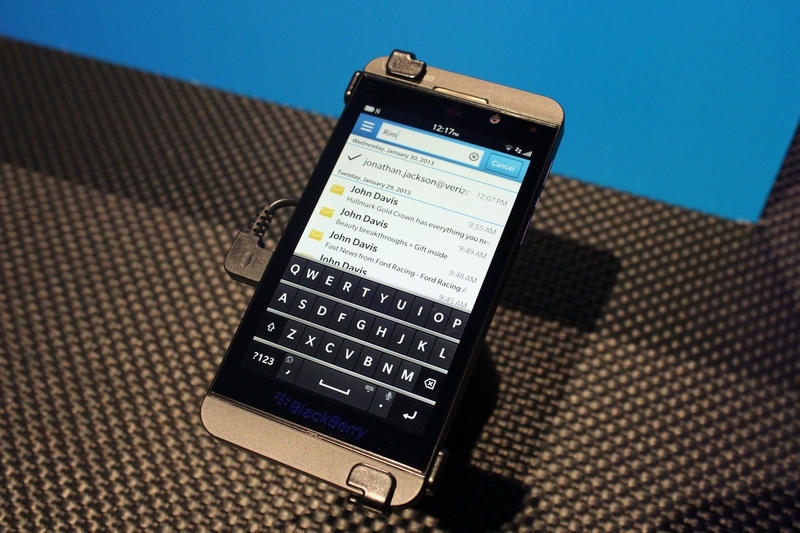 At the time of writing, applications that run on Android Gingerbread can run on BlackBerry 10. When version 10.2 comes out, it will bring support for Android JellyBean 4.2, bringing more modern applications to the platform. Documents To Go has been around the block a few times now, having been present on earlier BlackBerry devices. It is a cornerstone of the platform. So, what is it? It’s a pretty solid office suite makes it easy to compose documents, edit spreadsheets and view presentations on the go. It comes with the usual formatting options that you’d expect from an office suite, as well as allowing you to export to the latest file formats. This makes your BlackBerry smartphone more than just a communications device, but also a powerful tool for productivity, especially when combined with the physical keyboards that are present on the Q5 and Q10 devices. Webkit is everywhere these days, having successfully made the transition from the desktop to the smartphone. It goes without saying that BlackBerry 10 is no exception, and comes packing with a browser that is not just speedy and that renders everything as you’d expect. It also comes with a feature called ‘Desktop Mode’ which modifies the user-agent string to show webpages as they would on the desktop. This is handy for those times when the mobile version of a page simply isn’t good enough. Despite its many shortcomings, iTunes handles media synchronization really well and makes it easy to move media between your computer and your iDevice. BlackBerry Link goes one step further and cuts the cables, bringing to the table a beautiful user interface and wireless synchronization without the need to even be in the same room as your phone. It has never been easier to keep your phone updated with the podcasts, songs and movies you love. Another handy feature of this is that it makes it easy to retrieve your files and photos from your phone, should it be lost or stolen. Print To Go is an integral feature of BlackBerry 10 which aims to cut down on the massive amounts of paper waste that is produced by making printouts. Simply put, it makes it trivial for you to send a document to your smartphone. By installing a driver on your computer and authenticating, you can start shifting documents to your phone by using the very familiar ‘print’ window and selecting ‘Print To Go’. Once sent, your documents are transferred to your phone in just a few seconds and can be found in the Print To Go application. All content is encrypted before transmission, meaning that your private documents is kept safe from prying eyes. I can imagine this would be especially handy when you catch a flight or go to the cinema and have to print out your own documents. The BlackBerry 10 operating system does what many thought would be possible. It offers a compelling, beautiful phone experience with all the bells and whistles whilst staying true to its enterprise heritage. Will you be giving it a go? Let me know in the comments below.